I have been so busy this last few weeks with work, sorting out our flat after building work and generally stress in our building that I feel like I never have enough time to keep on top of things. So sorry for another brooch related post but I promise the next time I blog there will be no products in site. 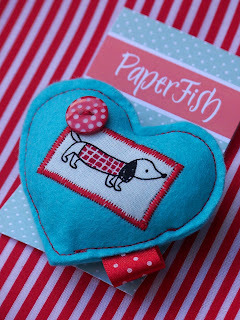 I did have to just let you all see the most gorgeous new colourway of dachshund brooch from Paperfish that I received today and had to put straight into my notonthehighstreet shop. Loving the turquoise and red combo. The green version has sold so well that I have restocked with that one too but I decided to offer another colour to give you all a choice. Hope you love it as much as me.